We are very grateful for a smooth border crossing yesterday. First we had to go inside on the Mexico side to return our visitor visas, then we all had to scan our luggage through at US Customs. The bus was checked (sniffed) over, then we were good to go, all within an hour. We got to our hotel, found our rooms, then bagged our dirty laundry. The food committee who needed to do some shopping, along with the one person from each room assigned to laundry left on the bus to take care of their business. The rest of us found food in the area and exchanged some money. It's nice to be back in the US, although we all enjoyed our Mexico experience. It's nice to drink tap water again and flush TP. It was nice to eat a big juicy burger again. It's nice to be able to speak English to everyone again. Visiting a country like Mexico really shows us our sense of 'entitlement' we Americans have. We take so much for granted. And yet often it's these people with less that are more content. The things of this world sure don't satisfy. This morning we boarded the Battleship (one of the names this bus has - we're all soldiers of the cross) at 5:45 and drove to a scenic overlook of El Paso to have a Easter sunrise service. It was a great spot with a view of the city lights and the ascending sun behind the distant mountains. One problem: Security was shutting down the place for the morning, so we had to vacate and find another spot. I found it strange that the place is open all night but closed Sunday mornings (Easter?). Although we didn't find a spot quite as nice, we still had a vantage point of the sunrise. We watched the sunrise, then sang some songs, reflected back on our time in Mexico, Bob had a devotional on Jesus' sacrifice for us, we sang "He is Worthy," Andrew talked about the powerful lines in the song, Tony led a time of praising God in thankful prayer, then Kyle led a silent prayer time on the bus as we drove back to the hotel. It was a really good morning. We're now on our way to Seminole, TX, where we plan to give a 7:30 program at Grace Mennonite Fellowship (the name of my church!). This will be the first of 4 stateside programs we have left on this tour. We serve a worthy God! He is worthy of all blessing, glory, and honor! Think about what that means... That's a challenging true statement. Thursday we had another good train ride on the Chepe Express. We arrived back in Creel at around 5:45, and from there roamed the town in groups for supper. We met up again at the Overholts, and from there went to our nighttime locations. This was the extra day in Creel that wasn't originally planned because we had been planning to go back on the train a day later, but the Express schedule had us back a day earlier. The Overholts planned for us to visit a mountain village 50 miles from Creel, called Samachique. The Tarahumara Indians are the main inhabitants in this area. The bus driver and I were a little skeptical of driving this road that looked really hilly and curvy on Google Maps. But the Overholts assured us that busses (albeit smaller ones) travel the road every day. And it turned out to be a paved road that wasn't too crazy. That being said, you wouldn't want a beginner bus driver to drive it. It was very hilly and some of the turns were the textbook hairpin turns. It was a very scenic drive as we drove through canyons. At points, there were 400ft+ drops just feet from where we were driving. It was hard to focus on our morning devotions that one of the guys had. We ate a burrito lunch that one of the local ladies made for us. We sang in a rented community centre at 2:00. There weren't a lot of people, but some of the locals came out as well as some of the local church. These people are very interesting. They are fairly disconnected from the outside world and hold on to many traditions. During the program we had to compete with drums in the distance. They beat on drums so that the days get longer so their crops grow well in the summer. They dress very colourfully. These people are known for their excellence in long distance running. Clayton recommends the book, "Born to Run," which is written on these people's incredible running ability. They make and wear these sandals made out of tire rubber. It was a bit hectic getting back to Creel as those of us that had been staying at YWAM were moving to a hotel, so figuring out the luggage and arrangments for us and the 2 other hosting places was a challenge, but we all figured it out eventually. I am very grateful for a strong dean team at my side that helps me and fills in the gaps I can't. 🙂 Once again, we split into groups to get supper in the touristy town of Creel. We had a nice campfire at the Overholts before going to our beds. Right now we are heading to the border. Should be hitting it in a couple hours. We had 15 large pizzas ordered ahead for lunch, which saved time. We got early to leave on the train. We left YWAM at 6:10 . Our train left at 7:30am. The Chepe train is one of the world’s greatest ‘train adventures’ according to one source. And it was! We got to see some of the Copper Canyon on the trip. The windows in the cars aren’t the cleanest, but you can stand in between the cars and open the upper half of the door and get a perfect view – super nice for pictures. There are a lot of tunnels and bridges. The one bridge over a river we figured to be around 300 - 400 feet high. It was a 5-hour ride. We all ate lunch in the restaurant car – classy food for a half decent price. Some slept, some played games, and some like me took a lot of pictures. Once we got to El Fuerte, Loren Yoder and several others from DNI were there with pick-up trucks to transport us 50 minutes to our hotel in Choix. Most people wanted to ride in the beds of the trucks, which was good because we needed to. It was significantly warmer in Choix than Creel since it is a lot lower elevation. It was more like what you’d expect from Mexico. Once we were settled into our hotel, we walked over to Loren’s house where he gave us an orientation and went over our schedule. We had supper at a Taco restaurant (so good! ), then played volleyball & ultimate frisbee with the DNI staff and some youth until 9:30. I was tired and worn out long before that. We walked to their church, Iglesia Seguidores de Cristo, for breakfast, after which we all went to the children’s home (orphanage) where we played with the children at their recess and got tours. After that, we had some free time to walk around the town. Some went up the 80ft clock tower, some went shopping at the little shops, some went to DNI’s coffee shop. I bought some ‘tire sandals’. The natives make these sandals with leather for the upper and tire rubber for the bottom sole. For lunch, we met back at the church. Then we split into three groups to sing for elderly people who can’t get out to church. We sang a few of our Spanish choir songs. Our group sang for an elderly lady who had recently become a Christian and was bed-bound. Our translators said she kept saying it sounded so beautiful and thanked us over and over. It was a wonderful experience. After that, we had ice cream at the Yoders, then went to our hotel to prepare for the program. This program was probably the choirs favorite thus far. The orphan children, locals, and DNI staff made up the audience, and all seemed to be touched by the ministry of singing. Loren asked us to sing “O Libertad” again at the end, which seemed to be everyone’s favorite. People that know me know that I don’t like singing a song in a language that the majority of the audience doesn’t understand. So I just love when I can tell others understand the words I don’t necessarily. After the program, we ate Tamolis that a local person made for us, then broke out in groups to go into the town again before going to our hotel rooms. Some of us bought hotdogs at the various hotdog stands. Mexican hotdogs – I never thought that would be a good thing (I would have laughed if someone said they wanted a hot dog in Mexico – like get a taco!?) But they are....picture this: the hotdog is wrapped in bacon (and maybe sandwich meat on top of that), placed in a warm fluffy bun, then loaded up with lots of toppings (guacamole, onions, salsa, cheese, ketchup, mustard, the list can go on). All this for 25 pesos ($1.50). Come on America, you can do better. We’re on the train right now, heading back to Creel. We’re going to visit the town again for supper, crash at the Overholts, then back to YWAM for the night. The Lord of the church has given his body a variety of gifts and roles “for the perfecting of the saints, for the work of the ministry, for the edifying of the body of Christ” (Eph. 4:12). This verse contains a three-fold directive for every born again follower of Christ. As saints, we are called to move toward and into the ongoing work of sanctification and perfection in our own lives. As Christ works in us, we become His hands and feet continuing the ministry of redemption which He initiated before mankind ever needed redemption. Finally, since we are designed to function as a body and not an isolated ear or foot, we must band together as a body to build up and encourage our fellow pilgrims as we journey together. 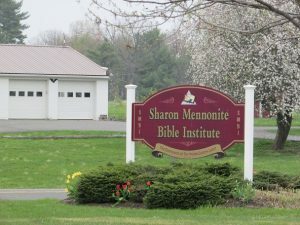 At Sharon Mennonite Bible Institute it is our vision to function as a support to churches and families as together we endeavor to see these directives fulfilled in our lives and the lives of our students. We have no desire to become another option in the smorgasbord of entertainment and diversion, but rather to be a dynamic tool that God can use to perform His work in and through each of us. We appreciate your support as we strive to perfect the saints, equip them for ministry, and build up the body of Christ.